Fairview United Methodist Church is having its annual Children’s Consignment Event on Saturday, June 24, and you’ll definitely want to make plans to be there. The sale starts at 8 a.m. and closes at noon for an hour. At 1 p.m. they reopen and everything without a red dot is on sale for half price. Sale items include clothing for all seasons for newborn to children’s size 16; all things for baby–furniture, strollers, pack-n-plays, etc., costumes, sports equipment, toys, puzzles, books, DVDs and gaming systems. For more information, call the church office at 865-983-2080, visit the Facebook group here, or RSVP to the FB event here. I am excited to be able to give away two passes for you and a friend to shop early on Friday, June 23 at 7:00 p.m. There will be two winners! If you’re not a winner, you can purchase presale passes at the door on Friday for $10 each, with all proceeds going to charity. Of course, if you choose to consign you’ll shop early as well! Registration is online this year, and you can sign up here. This giveaway will end on Monday, June 19 at midnight EST. Winners will be announced Tuesday, June 20 via Facebook. You can also get more information on the sale on the Fairview Consignment Sale FB group or the Facebook event page. The Blount County Library’s book sale is one of my family’s favorite places to shop for used books! 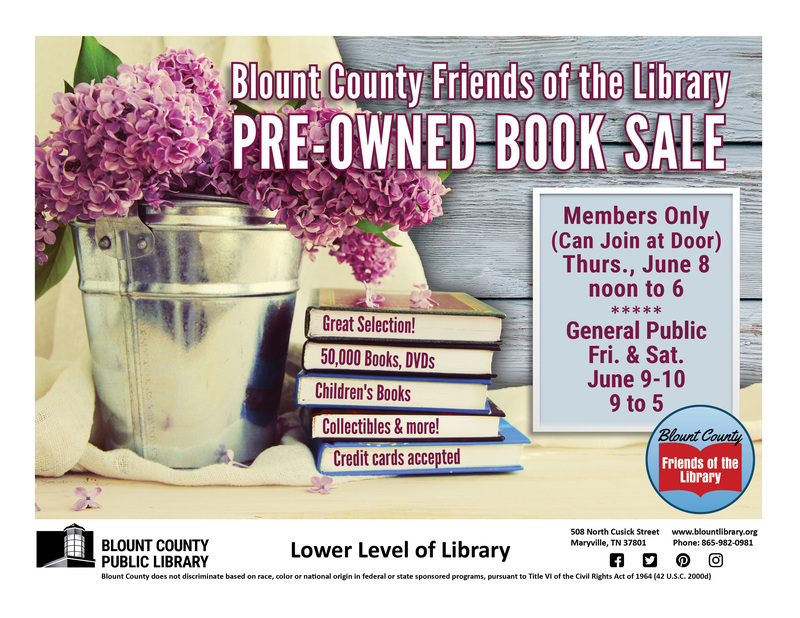 This summer’s sale will be June 9-10, with a special early shopping day on June 8 for Friends of the Library members. If you’re not a member – and I highly recommend becoming one – you can join at the door. Here’s more info.